*drawing in book* <-- picture of a Shard you haven't met. Khriss says there was Investiture on Threnody prior to Odium and Ambition's battle. Was that Investiture of Ambition? Are the Aethers from one of the Shards that we know? Or are they of a Shard we haven't learned about? Right now they are pre-Shattering. But I will probably change that. Atium was not a basic metal. Does the Era 2 table of 16 have a similar mistake? Is the chain in Celebrant made of Dragonsteel? Can Feruchemical tin store Allomantically granted senses like bronze sense? Are the Sho Del hordlings and/or a hivemind? The Sho Del are NOT a hivemind. Who was the last person Cultivation spoke to before Dalinar? Is he/she important? Has Hoid ever had a love interest? Was the planet destroyed by the Surgebinders Ashyn/some other Rosharan planet? [Personalization Request] To Hoid, with a message that hints at his quest. To make that which once was. What would a fully trained Seeker sense from Nightblood when it is influencing emotions? 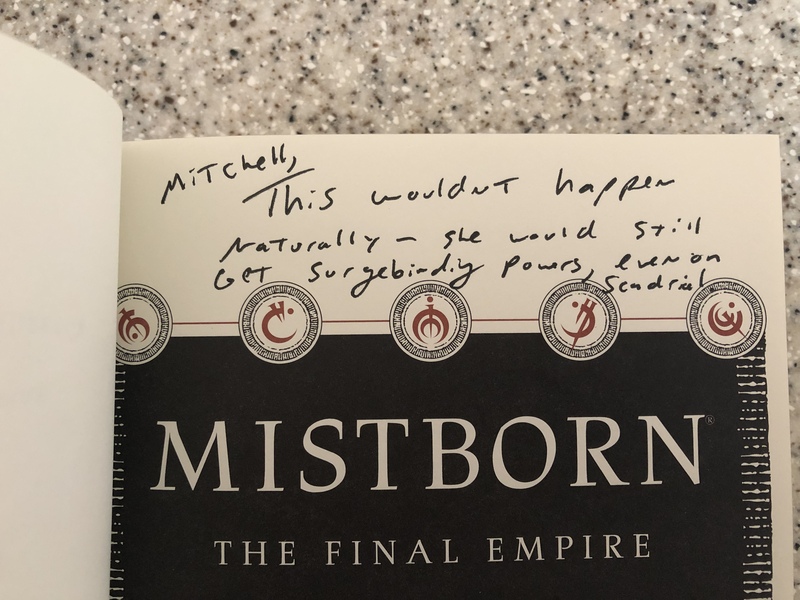 You've said that Rashek was slightly cosmere aware. Was he aware of the interplanetary trade through the Pits of Hathsin? Was Scadrial visited by any other Shard before the events of Mistborn? If so, which one? Is it possible to create a Hemalurgic spike with several stolen attributes? Is it possible to use Hemalurgic spikes to steal multiple attributes from the same person? If a person held enough breath to attain the 5th heightening, lived for a thousand years, and then sold all but their initial breath, would their spiritual age force them to rapidly age as we saw with Rashek, or would they resume natural aging from the point at which they ceased? I think they would rapidly age. But I'm not ready to say 100%. Dalinar has a task to "Unite them". Is it's ultimate purpose applies only to Roshar or it could go beyond Roshar, to the greater cosmere? This could be interpreted that way. Was the Astalsi religion somehow edited so that Sazed remembered it as [the] Dadradah religion? These two religions are branches of a more ancient religion. Nothing was edited in this case. Was Taldain one of the planets of the Iriali Long Trail? Was Scadrial? Since all matter and energy are Investiture in different forms, and the magic of Investiture depends on the Shard it is most closely connected to, could it be theoretically possible for Lift to burn food on Scadrial to have the powers of a Mistborn? This wouldn't happen naturally - she would still get Surgebinding powers, even on Scadrial.